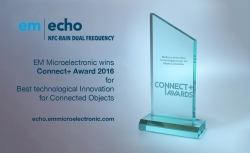 Marin, Switzerland, 13 December 2016 – EM Microelectronic, the ultra-low-power, low-voltage solution provider for connected objects, today announced that its EM-echo circuit was awarded Best Technological Innovation for Connected Objects at the Connect+ 2016 in Paris, an annual event for innovative identification solutions and smart objects. Rain RFID (also known as EPC Gen2) capable of high-speed, long range, multi-item reading operations common in today’s demanding logistics applications from production to the point of sale. Near Field Communication (NFC) privileged for single item, proximity range, customer related operation at the point of sale and beyond. The circuit features a common memory area and a common unique ID accessible through both protocols. The received award highlights EM’s ability to provide a unified RFID solution for logistics and marketing departments that simplifies the lives of both small retailers and product manufacturers looking to differentiate their products.